Humans aren't the only ones that can work a second job to earn a few extra bucks. At Belterra Park & Gaming near Cincinnati, Ohio, there's a bay gelding by the name of Trigger who, while not a Thoroughbred, is so much more than a one-trick pony. While he has never raced in the traditional sense of the word, Trigger has taken more trips around the racing oval than most of the horses he escorts to and from the track each morning. 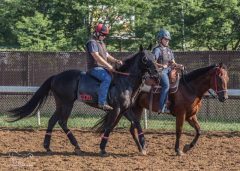 Ridden and owned by Kristina Bair, Trigger is the trusted stable pony and unofficial mascot for trainer Coty Davidson's 23-head racing stable. Every once in a while, though, Trigger gets to do a little racing of his own, bringing home checks and buckles as a barrel racer at some of the biggest rodeos in the region. While Trigger acts like he's been balancing the life of a track pony with being a barrel racer for years, it's actually only been in the last four years that he's learned either discipline. At just 9-years-old, Trigger's resume is already pretty well stacked, thanks to Bair, who purchased him while in college when she decided to make a drastic change in her equestrian life. Bair, who was living in Ocala, Fla., at the time, began thinking seriously about swapping her English tack for Western and started attending rodeos and shows more and more to watch, becoming both a fan and a student of the western disciplines. It wasn't before long Bair was looking for a horse of her own and came across a post on Facebook about a Quarter Horse gelding who was just about to turn 5. He was a cow-bred horse who, at the time, was being used for day work on a cattle ranch. Bair has made the most of Trigger's versatility in the four years since she purchased him. Together, they've not only ponied hundreds of racehorses (including regularly ponying the Davidson-trained Mr. Chocolate Chip, who finished a game second in the $100,000 Grade 3 Bashford Manor Stakes at Churchill Downs after breaking his maiden in near-track record time the race prior), they've ridden in parades, gone on overnight camping trips, gone to mounted shooting competitions and ridden countless miles of trails through the mountains. Barrel racing is where the pair shines though. Within the first year the two started running barrels together, Bair got her PRCA (Professional Rodeo Cowboys Association) card. 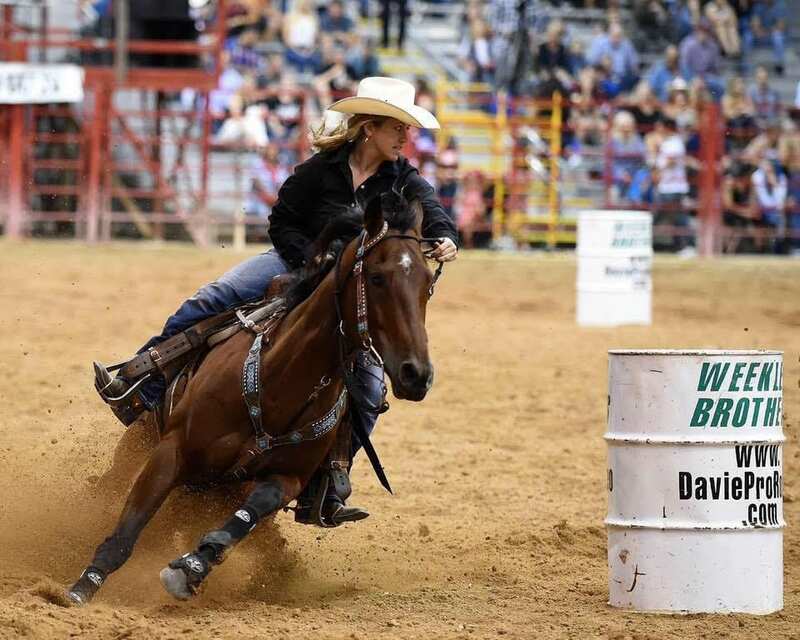 Last year the pair won year-end championship honors for the Flying G Rodeo Association and have been earning money on the open rodeo and barrel racing circuits throughout the region. Bair says ponying at the track in the mornings and even sometimes in the afternoons for the races is almost like cross-training for Trigger, keeping him relaxed and at a slower pace and keeping his mind fresh. It's also helped to give her a new, expanded perspective on equestrian sports. “The track is a completely different ball game than what I grew up with in the horse show world, but I love it. It doesn't matter if it's racing, dressage, jumping or barrels. If you're around a good trainer, they can teach you a lot that you can transfer to other disciplines,” said Bair. In the coming years, Bair hopes to get an off-track Quarter Horse or two to try to turn into future barrel racers, with a long-term goal of allowing Trigger to transition into her second-string horse as he gets older. This entry was posted in Aftercare Spotlight, Horse Care, NL List and tagged Aftercare Spotlight, barrel racing, belterra park, Cosequin Presents Aftercare Spotlight, Jen Roytz, Thoroughbred aftercare, thoroughbred retirement by Jen Roytz. Bookmark the permalink.